Our Campaigns - Candidate - James P. "Jim" Moran, Jr.
Moran, Jr., James P. "Jim"
Name James P. "Jim" Moran, Jr.
Info Congressman Jim Moran was elected to his seventh term in the U.S. House of Representatives in November 2002. He is a member of the Appropriations Committee, where he serves on the Defense Subcommittee, the Interior Subcommittee, and as ranking Democrat on the Legislative Branch Subcommittee. He also is the second ranking Democrat on the House Budget Committee. Representative Moran is 57 years old. He graduated from the University of Pittsburgh's Graduate School of Public and International Affairs with a master's degree in Public Administration in 1970 after receiving a B.A. in economics from the College of the Holy Cross in 1967. His political career began in 1979 with his election to the City Council in Alexandria, VA., a city of nearly 120,000 residents. Mr. Moran served as Vice Mayor of Alexandria from 1982 to 1984, and was elected Mayor in 1985. In 1990, he was elected to the U.S. House of Representatives to represent the Eighth District of Virginia. Throughout his career, he has demonstrated vigorous leadership in support of federal employees, women's issues, high technology, fair and open trade, and fiscal discipline. He is the author of legislation to provide military retirees with greater access to health care. He is well known for his efforts to protect federal employee and military retiree benefits and our public health care system. Congressman Moran is a founding member of the New Democrat Coalition, a group of more than 75 centrist House Democrats committed to fiscal responsibility, improvements to education, and maintaining America's economic competitiveness. 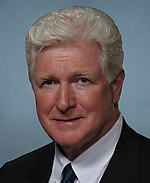 Congressman Moran was named as one of two "High Technology Legislators of the Year," by the Information Technology Industry Council. Later in 2000, Mr. Moran was named to the "Legislative Hall of Fame" by the American Electronics Association for his work on technology issues. In the 107th Congress, Mr. Moran was the chief sponsor of several bills and resolutions, including proposals to correct inequities for retired federal workers with part time service; provide transit benefits to legislative branch workers; and establish tax incentives for work-force training. Dec 12, 2012 08:30pm News Rep. Jim Moran's Son Pleads Guilty To Attacking Girlfriend Article J.R.